Hydrangeas are a good flower to dry indoors to enjoy in arrangements all year long. The simplest way to preserve them is by air drying. Leave them on the shrub until they start to feel papery dry, rustling to the touch, then cut them. Nature has really done the drying for you. Cutting is done before the flowers turn brown or become too brittle to use and long before the first frost. When gathering your blooms, keep in mind how you plan to use them and cut the stem length accordingly. I like to cut the stems long and then reduce to the size needed. Hydrangeas arborescens(Annabelles, PeeGees,Limelight) are long stemmed plants ideal for cutting. In the zone 6 climate where I live, the Annabelles seem to be the only hydrangeas that survived last winter’s brutal weather. They flower on new wood and can be cut with abandon. 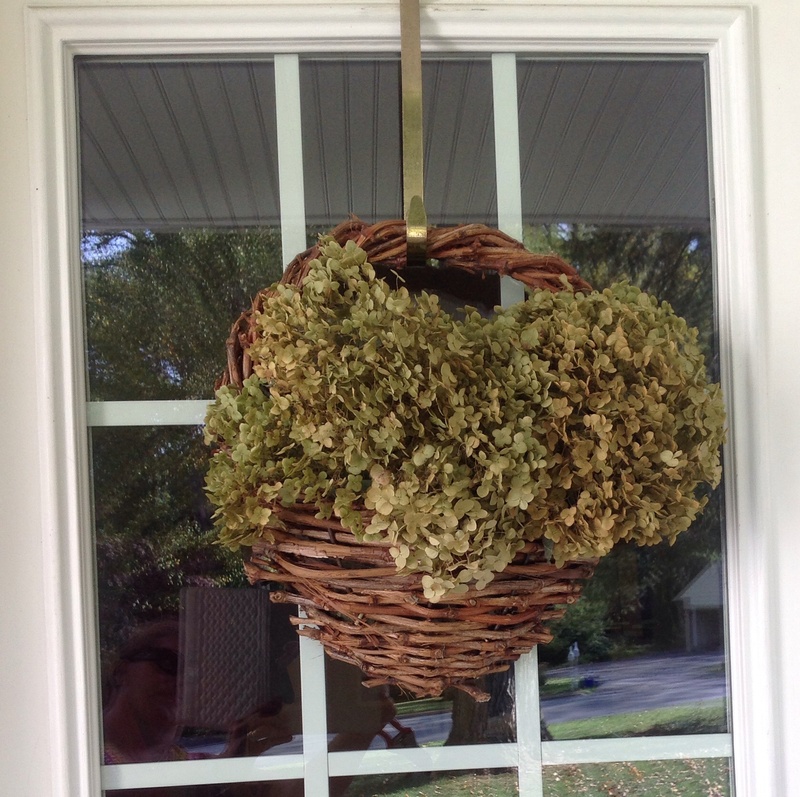 After admiring my friend Barb’s lush plants a few weeks ago and pining about not having my hydrangeas bloom this year, she surprised me with a huge dried bouquet of Annabelles on my front porch when I returned from vacation last week! I knew I had to write about the joys of dried hydrangeas. Hydrangeas macrophylla(Mop Heads, Lacecaps) flower on old wood and tend to have shorter stems. These should be cut above the first set of buds so as not to affect next season’s flowers. Many Northeast gardeners did not have the H. macrophylla shrubs bloom this year, much to their collective chagrin. I am told they should rebound and return next season. Once you bring your hydrangeas indoor, strip all the leaves. 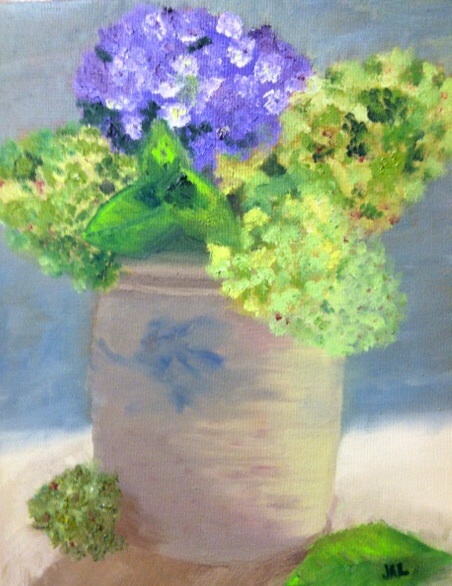 The dried flowers will have a more muted coloration. As the flowers lose moisture, the pigment remains behind albeit in a softer hue. White blooms may dry to a creamy yellow or to a greenish brown hue. Bright pinks may become a deep red when dried. Store them either upright in a container or tie them upside down. Either way they are ready to use in your arrangements. It is best to arrange the flowers soon after cutting in whatever container you have chosen. Once the flowers have dried, the florets become brittle and difficult to rearrange. 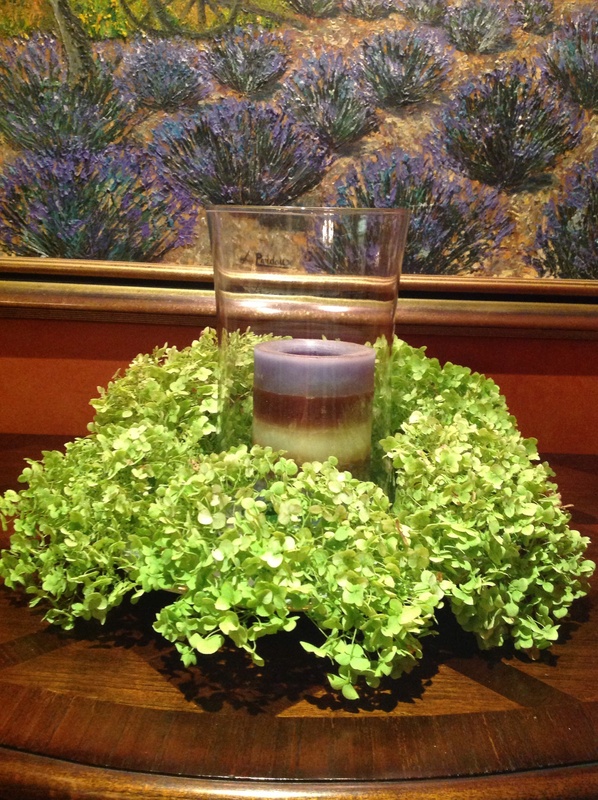 To create an easy table centerpiece, circle a hurricane with a crown of hydrangeas with the stems cut short. I placed the hurricane in a platter with raised sides then simply nestled the hydrangeas all around until the platter was concealed. 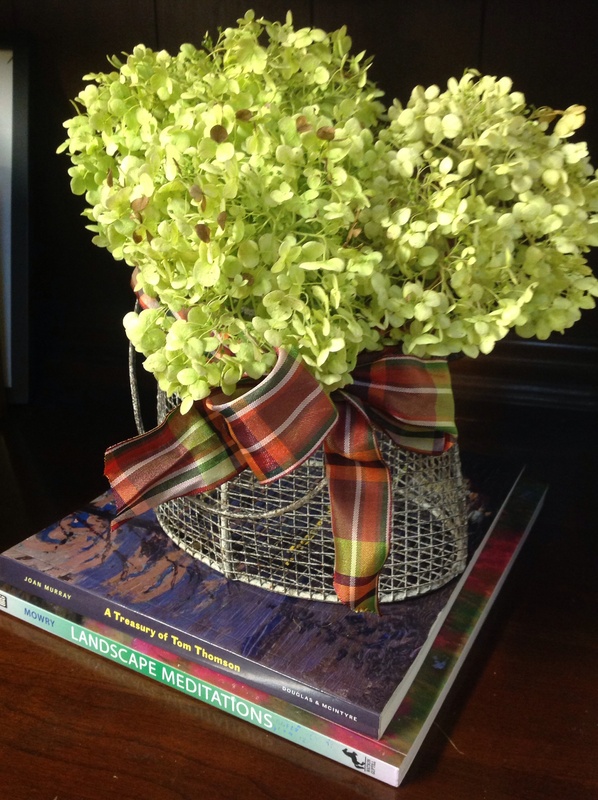 A trio of stems in a galvanized steel basket is a simple arrangement on a bookcase. A complimentary ribbon adds a punch of color and a professional finish. A big bunch in an earthen vessel creates a magnificent fall arrangement with a few seasonal gourds as an accent. 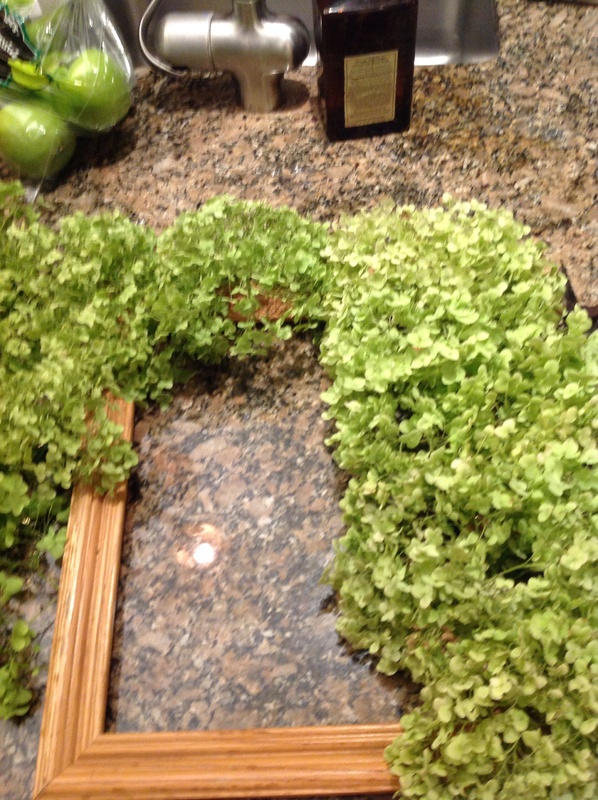 My favorite project with dired hydrangeas was making a rectangular wreath using an old frame, a glue gun and hanging the wreath with a ribbon. 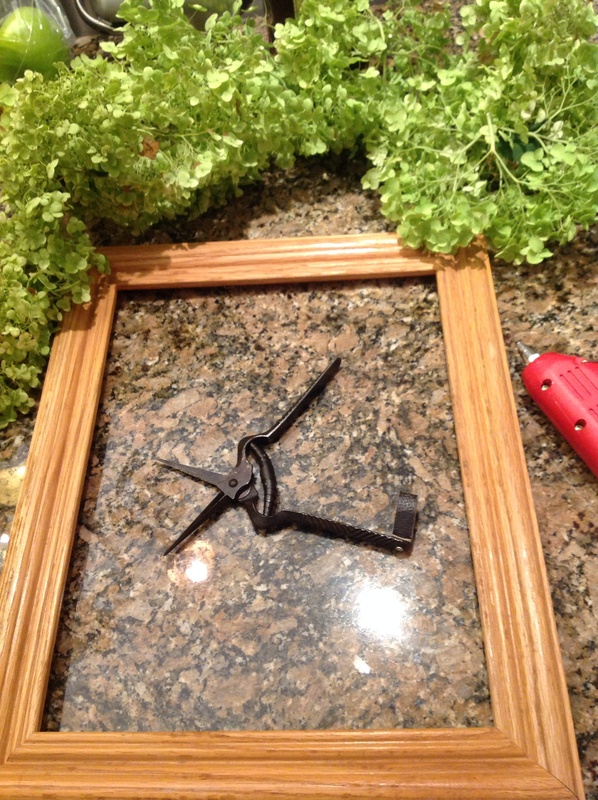 I found it easier to put the glue on the frame first and to stick the flower in the glue than trying to glue the flower first. 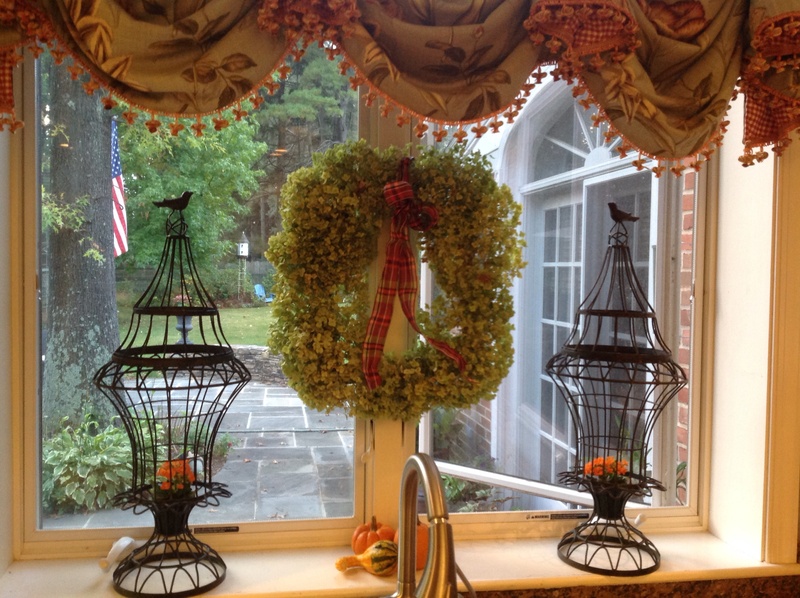 The finished wreath, hanging above my kitchen sink! A mini cluster cut from the larger bloom is perfect as a gift topper. The dried hydrangeas will last all year and even longer, if kept out of direct sunlight. 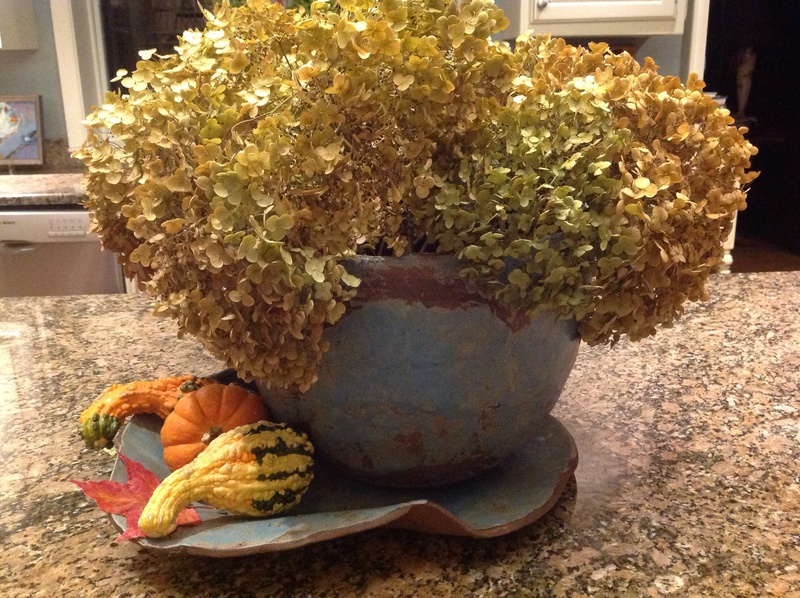 With dried hydrangeas, think beyond fall arrangements. 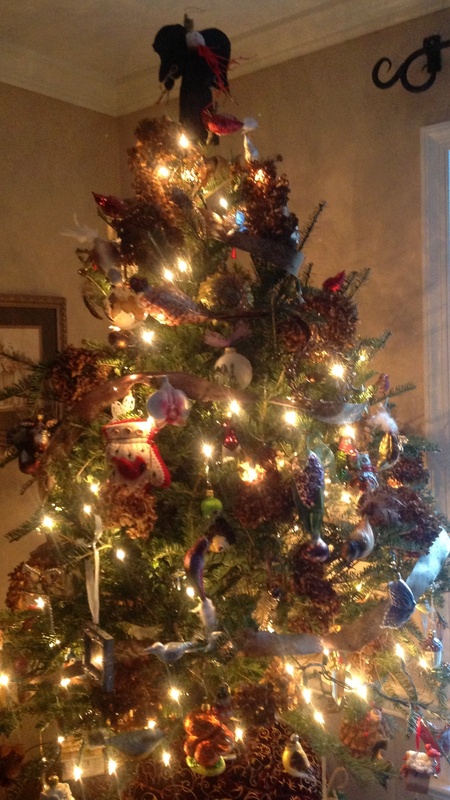 I like to use them in a garden-themed Christmas tree. They add texture and dimension, are light weight and organic. I sometimes add a little sparkle with a light spray of gold paint on the tips of the flowers. At the end of the season, they go out with the tree, no storage needed! Dried hydrangeas are versatile and bring long lasting beauty from your garden indoors. How will you showcase yours? This entry was posted in Crafts, Gardening and tagged Air drying hydrangeas, DIY hydrangea covered frame, hurricane lamp with hydrangea wreath, hydrangea wreath on a wooden frame, hydrangeas in flower arrangments, preserving hydrangeas by Johanne Lamarche. Bookmark the permalink. What lovely ideas for decorating! Glad you liked this post Hilda. 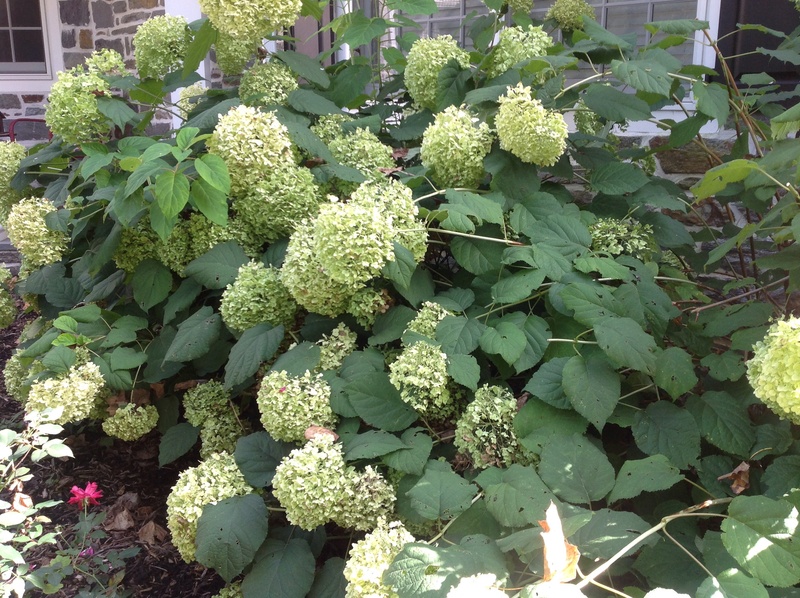 Did you lose the hydrangea macrophyllas in Ontario also last winter? We are all pining for hydrangeas we lost down here. Fingers crossed for next year! Mine did better than ever, and I’m not sure about others. I should collect the blossoms soon. 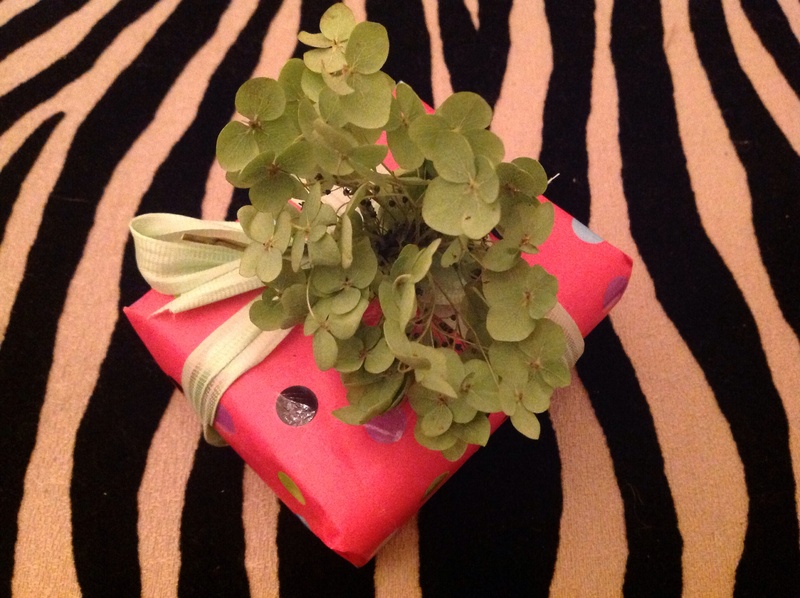 Have you ever tried preserving them using water and glycerine. I have tried, but with no success, but I know others who have done it and they stay fresh looking all year.